Disfrute de la belleza natural de Doubtful Sound en un crucero de una noche con salida desde Manapouri en la Isla Sur de Nueva Zelanda. Navegue en un velero tradicional de tres mástiles (barco con el fondo plano) a lo largo de las aguas cristalinas de los fiordos y disfrute de un gran variedad de fauna local, como delfines, focas y pingüinos, en su hábitat natural. 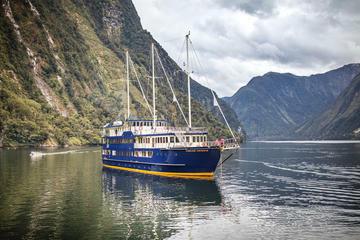 Puede unirse al crucero en Manapouri o incluir los traslados en autocar de lujo desde Te Anau o Queenstown. Real Journies looked after us royally from start to finish. Both vegetarians so a bit concerned about the menu on board. No worries!! There was more than enough veggie food at every meal. Staff 'n' crew cheerful, helpful skipper and nature guide absolutely superb. Have already recommended this company and this tour to my cousin who intends to do it in feb 2018. Not enough superlatives to bestow on them. And I don't normally give reviews as I'm told I'm difficult to please. Not in this case though, 10 out of 10. A must-do cruise!! What an adventure! This was a magical experience, before our trip I was tossing up between an overnight on Milford or Doubtful of which won out and I'm so glad we did. The staff were great, boat comfortable, meal amazing and experience out of this world. Such a wonderful experience! Although trip to cruise was long, it was worth it. So glad we did the over night tour since the second day was rainy so we saw thousands of waterfalls. We also saw seals, whales and porpoises. The entire trip was handled professionally from pickup to drop off. Beautiful views, the crew were great, food excellent. loved the cruise -- staff were so friendly, knowledgeable and passionate about this beautiful cruise. 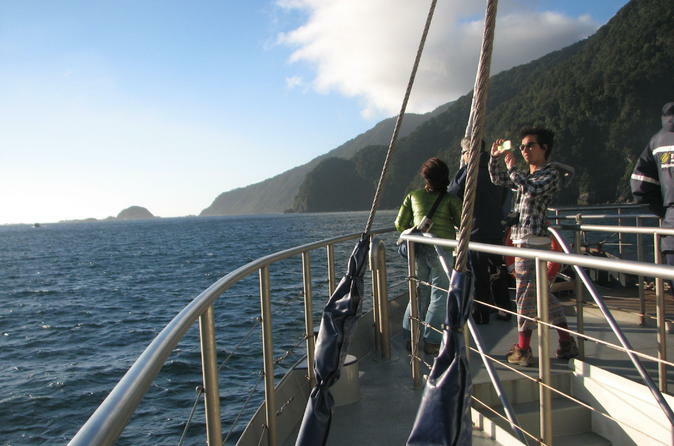 we did a 2 hour cruise on Milford Sound and were SO happy that we chose to overnight on Doubtful sound - it is much longer and has many more nooks and crannies. would highly recommend the tour. We especially loved the Sound of Silence where all engines were turned off and everyone was still and quiet for a few minutes.... just amazing! It was a fantastic trip. I wasn't prepared for how long the bus ride and boat were going to be to get to the sound, but it was very organized and beautiful views along the way. The nature guide and captain were super friendly and knowledgable. Even though it rained we got to see tons of waterfalls and the next morning was clear. It's expensive but worth the price. Beautiful scenery and great boat. I highly recommend this tour when in New Zealand. We had a sunny first day and the kayaking was fantastic. Just remember to put plenty of insect repellant on to combat the sand flies when kayaking. I had been bitten at Buller Gorge so put plenty of repellent on. I forgot my head though and still ended up with a few bites. Sand flies are a problem in many parts on the west coast. One of many highlights during four weeks in New Zealand. Wonderful views, excellent food, comfortable cabin and amazingly enthusiastic, friendly and hardworking crew.